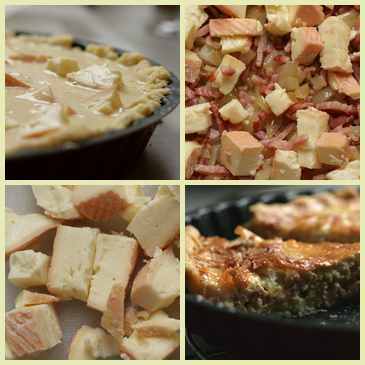 Here is a simple quiche recipe that uses melted Munster cheese to its best advantage. For a complete dinner, start with a green salad then follow with this quiche served with a baked potato. By the way, nothing is to stop you from making this quiche with Muenster cheese - it will perhaps just be a little less flavorful. Begin by blind baking the quiche crust. Fit the pie crust to a 9 or 10 inch quiche pan and prick it about twenty times with the tines of a fork. Place the pan in the freezer for 20 minutes while the oven preheats to 400°F. Bake the frozen crust for 10 minutes, then remove it from oven and allow to cool. Meanwhile heat the olive oil on medium heat and add the onion. Cook, stirring occasionally, until the onion softens some - about five minutes. Add the bacon and continue to cook until the bacon is cooked through. Remove from heat. Whisk together the eggs, white wine, crème fraîche (or whipping cream), cumin and salt and pepper. Cut the cheese in about 30 pieces. Distribute the cheese and bacon bits evenly onto the cooled crust. Pour the egg mixture on top and bake at 325°F for 40 minutes.